Jhpiego’s initiative to advance postpartum family planning in Burkina Faso has led to a significant investment in expanding women’s access to the postpartum IUD. Ouagadougou, Burkina Faso—With grit, tenacity, just $200,000 in startup funding and a dynamic team of family planning (FP) trainers, an effort to provide women in Burkina Faso with access to long-acting FP immediately following childbirth has succeeded beyond all expectations. The success of that initiative, carried out in collaboration with the Ministry of Health (MOH), has leveraged additional resources from UNFPA and other donors to scale up the availability of postpartum family planning (PPFP) services and access to the IUD in the immediate postpartum period, broadening access to FP even more widely in the West African country. 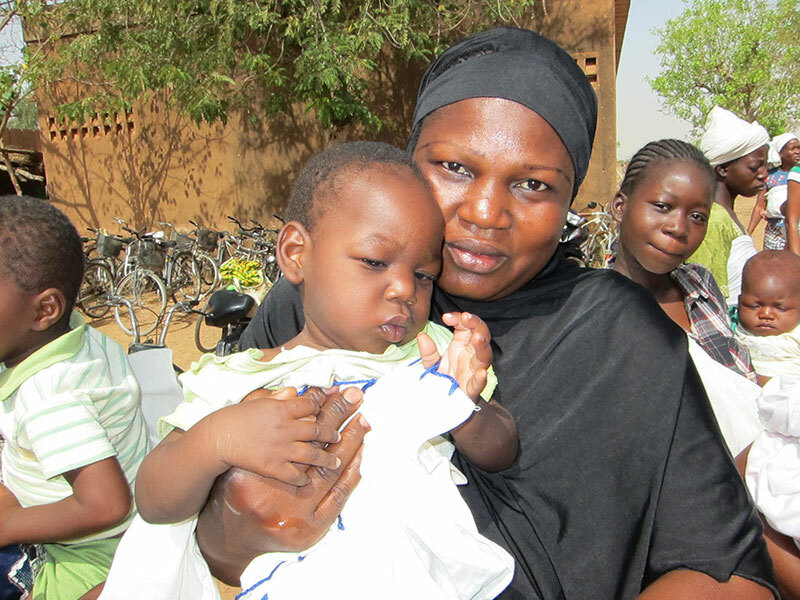 Since April 2013, more than 1,600 Burkinabé women have adopted a PPIUD through this initiative. Martine Ouedraogo, a midwife at Souro Sanou teaching hospital in Bobo-Dioulasso, has seen firsthand the benefits of increased access to long-acting FP methods. She described the experiences of a mother of three, Sawadogo Djénéba, who opted for a postpartum IUD (PPIUD) after learning about available options during the immediate postpartum period. During her third pregnancy, Mrs. Sawadogo had nearly died in childbirth. Sadly, the baby did not survive. Mrs. Sawadogo said she had considered having a surgical procedure to prevent more pregnancies, but learned that such a procedure would be permanent. The idea of not being able to have any more children frightened her and her husband, both of whom preferred a long-acting, reversible method instead. “I was really touched by what Mrs. Sawadogo told me when I counseled her and gave her options of contraceptive methods after delivery. She told me that it was the first time she had been offered a long-acting family planning method before leaving the maternity. This made me realize the benefits of the important work we do with Jhpiego to improve access to postpartum family planning,” Ouedraogo said of her client’s decision to choose long-acting contraception. Jhpiego committed the first $200,000 of funding to the FP initiative following the London Summit on Family Planning in July 2012, and a plan of action was quickly put into place. In collaboration with Burkina Faso’s MOH, and after a review of the government’s revised strategy on family planning, Jhpiego identified PPIUD services as a key entry point for increasing contraceptive use, along with integrating maternal health care and FP services. To start off the initiative, Jhpiego supported two complementary skill-building courses in five public hospitals in March 2013. These activities aimed to contribute to the MOH’s goal of increasing contraceptive prevalence from 15% in 2010 to 25% by the end of 2015. Fifty health care providers from antenatal care and maternity services participated in the first course on PPFP counseling, which emphasized promoting contraception in the postpartum period for healthy timing and spacing of pregnancies. Thirty physicians and midwives who had participated in the counseling course then completed the second course on PPIUD insertion techniques. Facilities received instrument kits, data collection tools, counseling materials and an initial supply of consumables and infection prevention materials. As part of the PPIUD training, providers were also oriented on accurate collection, reporting and use of data. The success of this pilot of PPIUD services at the five facilities leveraged additional resources from UNFPA Burkina Faso for Jhpiego to extend PPIUD service delivery to 20 additional sites between October 2013 and February 2015. With a total of 155 health care workers providing PPFP counseling and 94 health care workers able to provide the PPIUD, these services are now available in 25 hospitals and health centers across six of the 13 regions of Burkina Faso. During the second phase of the extension, Jhpiego also qualified a pool of 15 local trainers who will be able to support further scale-up. Activities are continuing for in-service training of providers. During this scale-up, women responded positively to the counseling for this long-acting method. For example, between April 2013 and February 2015, 1,629 women receiving services at 14 facilities chose the PPIUD. Data from the first participants revealed that women of all ages chose the PPIUD method. Seventy-two percent of women adopting the PPIUD already had three or more children. Follow-up visits in the first year showed promising findings—among the 970 women who had already had their first follow-up appointment, 88% reported no problems with the method; in 8% of cases, the IUD strings were not seen on exam, 2% showed infection and 2% experienced expulsion. During site supervision visits, recommendations were made to overcome communication challenges between staff in the FP clinic and those in the maternity ward to ensure accurate reporting related to follow-up visits. Recommendations included holding monthly meetings, writing PPIUD follow-up visits in the register, encouraging women to come for follow-up and noting clients’ phone numbers in the register so missed appointments could be tracked. From the relatively small initial investment, to additional funding from UNFPA, the project continues to make great strides. As of April 2015, Jhpiego is launching a new, three-year project with more than $7 million in funding from an anonymous donor. This project will further support scale-up by endorsing integration of PPFP and PPIUD with pre-service training of midwives and ob/gyns and support new graduates as they take up their first posts—giving even more women like Mrs. Sawadogo the opportunity to plan for the future of their families and ensure that they thrive.